Scientists know that the blood and tissues of some deceased beaked whales stranded near naval sonar exercises are riddled with bubbles. It is also well know that human divers can suffer from bubbles-induced decompression sickness, also known as the bends. What researchers know comparatively little about is how living marine mammals handle the compression of lung gas as they dive deep and then resurface. Now, in a study published online in the Proceedings of the Royal Society B, a team that includes researchers from the Woods Hole Oceanographic Institution (WHOI) has confirmed that bubbles do form in live, stranded dolphins. But in many cases, those animals are able to "manage" those bubbles and can resume relatively normal lives of swimming and diving in the ocean. "Evidence suggests that live dolphins that have been stranded have bubbles that appear not clinically significant," said Michael Moore, a senior research specialist in biology and director of the WHOI Marine Mammal Center. The multi-institutional research team, led by Sophie Dennison of the Marine Mammal Center in Sausalito Ca., performed ultrasound scans on 22 live stranded and capture-release dolphins. The researchers examined the liver, kidneys, eyes, and blubber-muscle interface. They found gas in the kidneys of 21 of the live stranded dolphins and in some liver veins of two of the animals. Nine then died or were euthanized, and the presence of bubbles was corroborated by computer tomography and necropsy examinations. Of the remaining 13 that were released, 11 did not re-strand. The researchers said that off-gassing of supersaturated blood and tissues was the most likely origin for the gas bubbles. "In contrast to marine mammals repeatedly diving in the wild, stranded animals are unable to recompress by diving, and thus may form bubbles," they report in their paper. "Since the majority of beached dolphins released did not re-strand, it also suggests that minor bubble formation is tolerated and will not lead to clinically significant decompression sickness." The results, Moore said, "suggest that dolphins are possibly managing bubbles routinely to avoid decompression sickness, also known as the bends. Humans likewise manage 'silent bubbles.'" Only a minority of human divers that get bubbles, he added, get the bends. Moore said it was the observation of bubbles in deceased beaked whales that led to the current study. "In routine decompression, the animal exhibits normal physiology and experiences few bubbles," he said. "But acoustic stressors, such as sonar, seem to change normal bubble management." "Beaked whales are stranding atypically when exposed to sonar," Moore said. "The beaked whale mortality events have led the current generation of marine mammal physiologists to revisit the question of how marine mammals manage the issue of lung gas being compressed as they dive deeper," he said. "Above the depth of alveolar collapse, a depth at which the gas-exchange surface of the lung is no longer inflated, increasing pressure with depth can cause gases to dissolve in the body; the gases then come back out of solution as they resurface. If this decompression is uncontrolled, bubbles can form. In humans such bubbles can cause joint pain that is relieved by 'bending' limb joints - hence the popular name. It was thought that marine mammals were immune to such problems, but the beaked whale cases reopened this assumption to fresh scrutiny." Moore said the study is but one piece to the puzzle of possible effects of how human or environmentally induced changes to ocean conditions might affect the health and behavior of dolphins. Nevertheless, he said, "We have shone a bit more light on bubbles in marine mammals." I ....um.....doesn't ultrasound cause cavitation ? If a whale has blood saturated with compressed gas at a depth, where signals are stronger due to salts, T/P,etc and all of a sudden they get bombarded with sonar, wouldn't that lead to internal cavitation ? That's kinda like extreme extracorporeal shock wave lithotripsy. I think I understand what they're saying...but I'm definitely not sure...This article is terribly written and confusing. First, the article should define 'stranding' - which(according to my research) is going up into shallow water too shallow for them to swim. apparently it does not necessarily mean helplessly so, but I think that's where they are going with this - They're studying animals that have beached, therefore they have been in a low pressure environment for an extended period of time. @isaac - I believe your hypothesis should be studied, but the distance from the sonar, and mitigating affects of blubber probably makes them believe that they physical properties of the sonar don't significantly cause cavitation inside the animal. Their hypothesis is that it affects the animals coping mechanisms. Lastly...it sounds like their methods of study may have been invasive on live animals. I wonder if the cause could be as simple as a too-rapid ascent from depth due to panic induced by the extremely loud noises. Even free divers (breath-hold) divers cannot disobey the laws of physics; you have to ascend relatively slowly or the nitrogen dissolved in the blood will bubble out, causing decompression sickness or 'the bends'. Mammals evolved to spend greater time at much greater depths would obviously have different gas saturation levels in their blood, as well as different off-gassing rates back into the lungs. It would be interesting to see a model that could predict what rates of ascent from what depths/times would result in nitrogen bubble forming. This could certainly be a plausible explanation of beached whales/dolphins (whether caused by man's activities or not). A creature in agony from the bends would be relatively unconcerned with where they are in relation to beaches/too shallow depths, etc (it's not outrageous to wonder if they'd intentionally do it either). If what you're saying is true, then they really shouldn't allow ultrasounds of human fetuses, right? I mean, it would cause cavitation in their brains! Yeah, probably would if they were deep sea diving. Slightly different conditions 4-5k' down Pauli. Isaaci, they did the ultrasound when the dolphins were beached, not at 4-5 thousand feet depth. "performed ultrasound scans on 22 live stranded and capture-release dolphins". 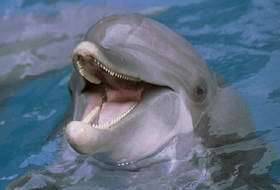 How would you get a dolphin to even stay still down there? Your condescending comment makes me think you have totally misunderstood the entire article. Maybe I'm way off though. And please don't call me Pauli, that's just rude. k, apologies for the name, I can't see so well, didn't see the j, so calm down. My point here is that ultrasound on a fetus, ECSL, and marine sonar, both naval and mammalian, are all different frequencies and amplitudes. You are familiar with the concept of harmonic oscillations right ? Ultrasound for something like ECSL is tuned so that the waves pass through the body and are absorbed by the object that is resonating at the same. Completely different than a sonogram , I cannot even believe you'd use that for comparison. See what would happen if you cranked the amplitude of the signal way up during a sonogram. Ultrasound will dissociate ionic bonds. If I'm wrong about that, I'm wrong.